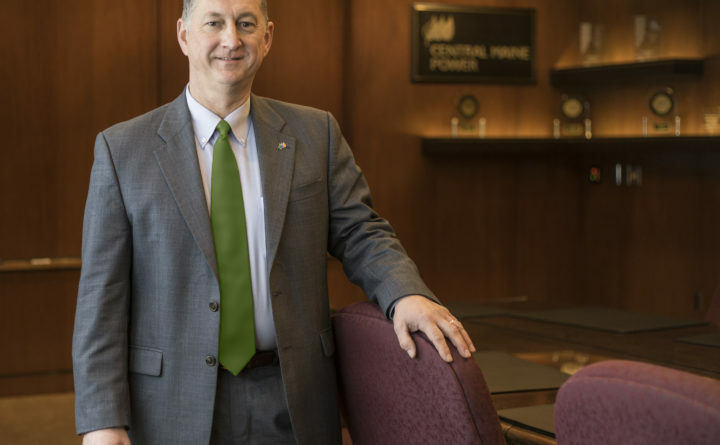 Doug Herling, CEO of Central Maine Power, is pictured in this file photo. Representatives of a group of 3,500 Central Maine Power ratepayers have sent a letter to Herling detailing a series of problems with bills and service and asking that a thorough investigation be conducted. The Public Utilities Commission is currently conducting a summary investigation of complaints. Representatives of a group of 3,500 Central Maine Power ratepayers sent a letter to the utility company’s President and CEO Doug Herling detailing a series of problems with bills and service and asking that a thorough investigation be conducted. The letter follows a request by Maine Public Advocate Barry Hobbins to the Maine Public Utilities Commission to upgrade its summary investigation, which is delving into the technical aspects of CMP’s billing and smart meter system, to a comprehensive adjudicated investigation. Hobbins’ request was denied by the PUC, which said it was premature as the summary investigation was still underway. PUC administrative director Harry Lanphear said at the time that the commission’s summary investigation will be “thorough and comprehensive.” Lanphear said the commission will decide whether further action is needed. The summary investigation only involves two parties, CMP and the PUC, while the comprehensive investigation could involve other parties, including the public advocate, and potentially carry penalties if any wrongdoing is determined, Hobbins said. However, CMP attorney Richard Hevey noted in a May 16 PUC filing that the public advocate is being granted access to confidential information in the case. The May 14 letter that was emailed to the Bangor Daily News was signed by Patrick Milligan and Lauren Loomis, who said they represented a group called CMP Ratepayers Unite. The group has a Facebook page with posts showing high bills and other information. The letter, which was formally submitted late Thursday to the PUC’s Lanphear, also was copied to Maine Attorney General Janet Mills; the Maine Legislature’s Standing Committee on Energy, Utilities and Technology; Public Advocate Barry Hobbins; Gov. Paul LePage and Steven McGrath, director of the Governor’s Energy Office. The group said lawmakers need to change PUC’s scope of authority to include protecting the public as a priority. It claimed the PUC has delayed the public advocate’s request to open a full investigation. It also said a Maine statute covering the PUC authorizes the attorney general to intervene before the commission to protect consumer interest. CMP spokeswoman Gail Rice wrote in an email to the BDN that the PUC’s administrative procedures call for a summary investigation first. “Elevating this to a full adjudicatory proceeding would be the commission’s call, if it found reasonable grounds to do so. We will fully cooperate with whatever form of investigation the commission determines to be appropriate,” she wrote.